Address: Fragata, 2, Playa Blanca (Lanzarote), Islas Canarias. 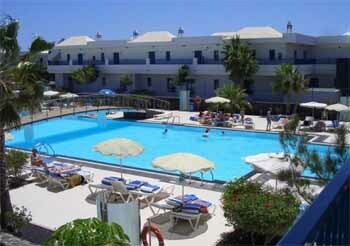 THB Tropical Island is set 900 metres from Lanzarote's Playa Dorada Beach. It has outdoor swimming pools, a spa and free public parking in front of the hotel. Apartments at the hotel are bright and comfortable. They have a full kitchen and a living area with TV. All the apartments have a balcony. Air conditioning is available from May to October. The THB Tropical Island has a hot tub, sauna and fitness centre. There are also gardens, a tennis court and a football court. The hotel offers an entertainment programme and children’s activities. The hotel has a bar, an Italian restaurant and a typical Spanish restaurant. Shows and entertainment are held in a large tent. There are many food and drink options in the nearby resort of Playa Blanca. The spectacular beaches of Papagayo are only 3 km away. Please note that once the guest has checked in and paid for the stay, a refund will not be given in the case of early check-out. Please note that air conditioning is only available from May to October. Please note that children are not allowed in the spa.